Just in front of Amanda and Jan is the edge of the large slab that forms the threshold to the new, wide entrance to Structure Ten. Carinated bowl in Structure Fourteen? 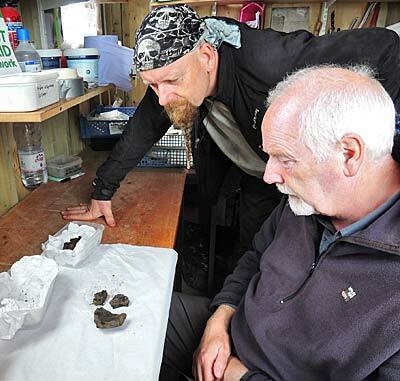 Mike and Roy examine the new carinated bowl sherds from under Structure Fourteen. Today was pottery day at the Ness, and, oh, what pottery. The prize find came from Hugo’s Structure Fourteen and a location we have mentioned a few times already. Specifically, it is the sondage alongside the north-west wall, which revealed, last week, a number of large stones under flagstones. It is what was found, pressed into the natural, that is of huge interest. There were six sherds, and some fragments, of a vessel, which was initially thought to be round-bottomed. That would have been interesting enough — round-bottomed vessels generally pre-date the Grooved Ware style, that makes up the bulk of the Neolithic pottery from the site. However, first examination suggests that the rounded sherds actually represent a carination — a change of direction in the wall of the vessel — and this also firmly suggests pre-Grooved Ware pottery. It may not be part of the classic so-called Unstan family of vessels, which are familiar to many people. Instead, it may represent a distinct element of Earlier Neolithic plain wares known as the carinated bowl. 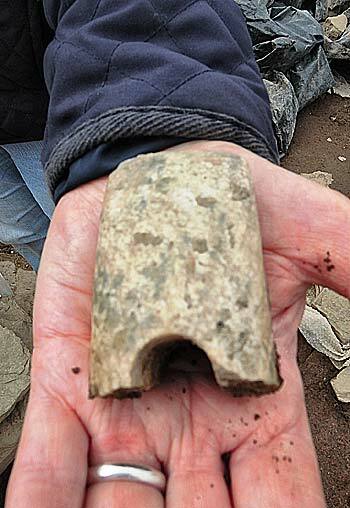 If so, this will almost certainly represent the earliest pottery yet recovered from the Ness. This is a very tentative identification and more information on the vessel will emerge as the sherds dry. However, there is also huge interest in the interior surface of the vessel which may, with luck, yield carbonised material which can be used for radiocarbon dating. Thus, we might have a start date for at least part of the site, further enhanced by the fact that the natural surface in Structure Fourteen is only a couple of centimetres different from that outside Structure One. All of which will be an enormous help to site director Nick as he works out the phasing and development of the Ness. The new macehead fragment from Structure Eight. More pottery is soon to come from Structure Twelve, where Mic is excavating a very large spread of pottery, some of which seems to be yet more of our handsome coloured ceramic. Structure Eight is maintaining its reputation for being Neolithic bling central, as Anne Johnston, the second-luckiest digger on site, has just unearthed half of a beautiful polished cushioned macehead in a lovely creamy-coloured stone. As usual this stunning object has been deliberately broken in half across its near perfect perforation – one day we WILL find the other halves! There was further dancing-up-and-down in the vicinity of Structure Ten, where the removal of the rest of the robber cut around the entrance fully defined the magnificence of the arrangements. The entrance is not 0.6 metres wide, as originally thought, but is, in fact, a staggering 1.8 metres wide. Its base is defined by a huge horizontal stone and, just inside, there is an area of handsome paving. Nick can’t call to mind any other Neolithic structure which has an entrance of this size. And the cherry on the cake? To the side of the entrance is a large stone with, nestled underneath it, a deposit of cattle tibia, the very same cattle leg bones found carefully deposited in such astonishing abundance in the passageway which surrounds Structure Ten. It is hard to think of a more surprising, or satisfying day. But ever greedy for archaeology, we will hope for even more tomorrow. 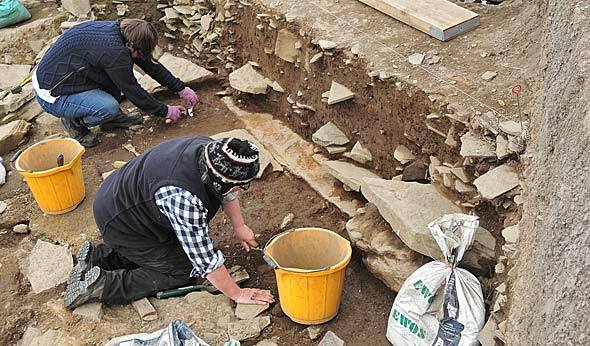 Hi, my name’s Rik Hammond and I’m a regular at the Ness of Brodgar excavations – but you won’t see me digging, as I’m not an archaeologist. I’m a visual artist living and working in Orkney and since undertaking an art and archaeology residency focusing on The Heart of Neolithic Orkney World Heritage Site, back in 2011/12, my art work has been primarily about (art and) archaeology. It’s been a busy season for me this year, having just spent a few weeks at The Cairns, in South Ronaldsay – and now on to the Ness. This year, I’ve been doing a lot of drawing – a great way for me to re-familiarise myself with the site – taking an unhealthy amount of photographs of the archaeologists and what they get up to (somewhere approaching 1,000 photographs and we’re only halfway through week two! ), tracking my movement around the area with GPS and taking a lot of video. Alongside the work I’m making during the period of the excavations, I’ll no doubt be very busy in the studio after the summer developing new work. You can find out more about my visual arts practice at www.rikhammond.com – and keep up to date with current work developed in response to this year’s dig, on my Facebook page at www.facebook.com/rikhammond.artist.